White short-sleeved shirt, with square rhombus shadow stripes, each with a darker right half and all set slightly to the left of an underlying diagonal grid. Navy blue crew-neck, with thin white stripe in middle and two thin red stripes either side of it. White plastic snap fastener on a navy blue rectangular insert beneath the neck, adjoining an overlapping red rectangular insert on the inside of the shirt. White underarm-half of hem, with outer red front quarter and outer navy blue back quarter on left sleeve, and outer navy blue front quarter and outer red back quarter on right sleeve. Thin navy blue stripe along shoulder. Embroidered emblem on left breast. Two embroidered navy blue concentric diamonds on right breast, with 'umbro' in navy blue lower-case lettering underneath. Red numbers on reverse, in the same font as on the previous Umbro England shirts, with a white border, outlined in red. Navy blue shorts, with white drawstring, check shadow pattern and red waistband. Thick white panel comprising lower third of seams, joining two thin white stripes edging upper two-thirds of seams, with a rectangular red block across the middle. Two embroidered white concentric diamonds on left thigh, with 'umbro' in white lower-case lettering underneath. Embroidered emblem on right thigh. White socks. Solid navy blue diamonds across tops, edged with two red hoops. Three navy blue lions on white square calf patch on each side of each sock. A long-sleeved version of the shirt was introduced for the games played in 1989 and was worn for the first time, at the start of the game in Tiran�, by just three players; John Barnes, Gary Lineker and Neil Webb. The cuffs were as per the 1984 white shirt; navy blue, with a thin white stripe in the middle and two thin red stripes either side of it. White numbers in the same font as on the 1986 World Cup shorts were worn on the left thigh of the shorts, above the Umbro logo, for each of the three 1988 European Championship tournament fixtures. 37 England internationals appeared in this shirt. Thirteen players won their first cap in the shirt, including Stuart Pearce, who went on to win 78 caps, David Platt, who won 62, Des Walker (59) and Paul Gascoigne (57). Ten players won their last cap in the shirt, as it was worn for both Kenny Sansom�s 86th appearance and Glenn Hoddle�s 53rd in the final match of the 1988 European Championship. John Fashanu and Mike Phelan were the only players to make all their international appearances in the shirt, though for Phelan it was for a mere 45 minutes. Fashanu appeared just twice. Lineker had also been the top marksman in the 1984 white shirt. Robson�s goals included his last of a total 26 as a full international. Chris Waddle was the only other player to score his last England goal in the shirt, his sixth in total. Four players scored their first international goal in this shirt, including Paul Gascoigne�s first of ten. The only game that Robson missed was a vital World Cup qualifying match in Stockholm, when he had to withdraw from the squad with bruised ribs. Butcher replaced him as captain and ended the game with his head bandaged and his shirt stained with blood. 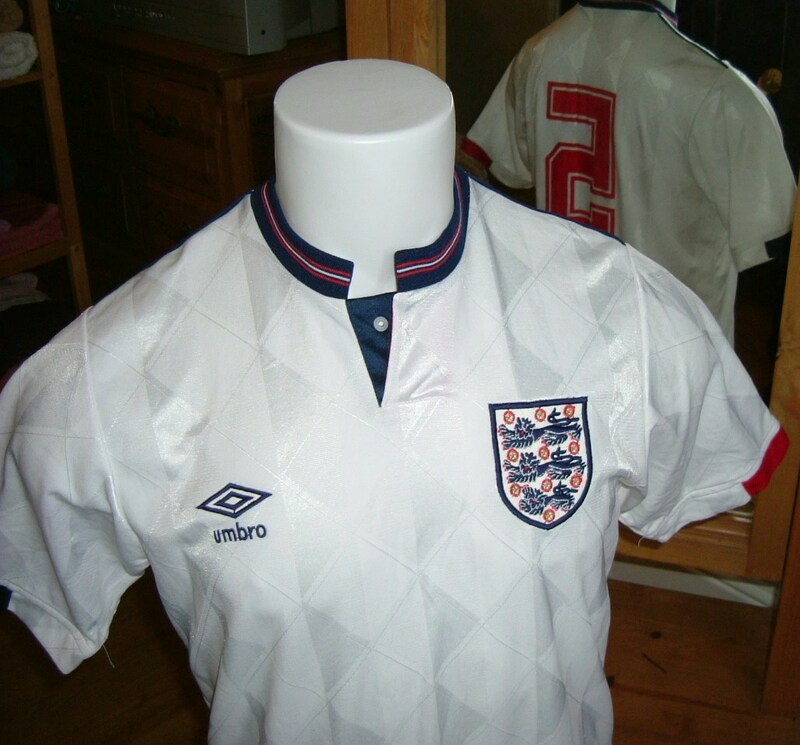 Umbro's second white England uniform in the modern era, revealed on April 30th, 1987, was similar to the previous design, but incorporated a revolutionary new material called 'Tactel', for maximum coolness in hot weather, yet still warm enough to keep away the English chill. The v-neck was replaced by a fastening crew-neck, a contrasting red waistband made the shorts stand out more and the Three Lions found their way onto the socks for the first time. Its match debut coincided with the expansion of the Rous Cup to include foreign opposition for England and Scotland, for the first time, and it was Brazil who took on England at Wembley. England went on to qualify for the 1988 European Championship by crushing their closest group rivals, Yugoslavia in a foggy Belgrade. The home fans were silenced by four first-half England goals. Understandably, England were installed as one of the favourites, but were immensely disappointing when they arrived in Germany for the final tournament. Three defeats sent them crashing out, without making an impression. Pride was restored, however, as England fought their way through a tricky World Cup qualifying group as one of the best runners-up, having completed their fixtures without conceding a goal. With Italia '90 fast approaching, Umbro were commissioned to dress England once more in a uniform to take on the world. 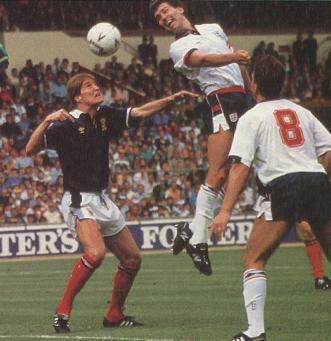 Notes England wore the white home shirt with the 1988 white away shorts, and the 1984 red away socks--against Chile. Notes England wore all white--the white home shirt and socks with the 1988 white away shorts--against Sweden. This shirt was commercially available from it's outset. At the Wembley Stadium Leisure Shop, the price of the 'Tactel' Umbro shirt ranged from �18.49 for a 22" chest shirt, to �20.49 for a 42" chest shirt. The shorts started at �9.25, to the larger �10.25. Socks were between �3.95 and �4.49.